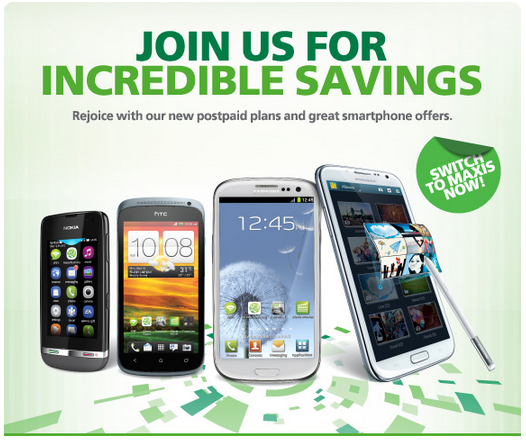 Tis the season to be shopping and if you were hoping to land your hands on a new mobile phone, Maxis has revised its phone bundling plans for its latest postpaid plans. 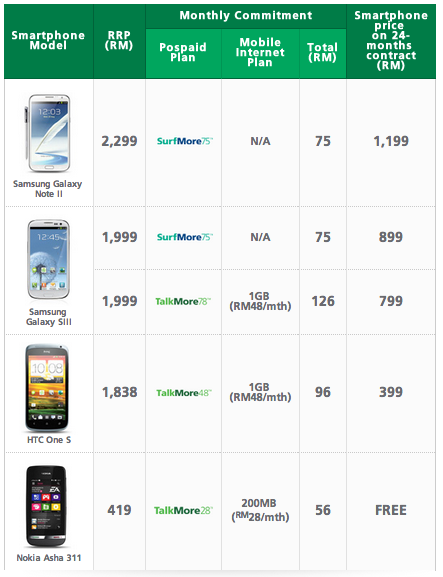 The telco has been on a roll lately to introduce new plans targeted at different segments of the market with TalkMore, TextMore and SurfMore plans and if the previous phone bundle weren’t attractive enough for you, check out these new offers that can get you the Samsung Galaxy Note II from as low as RM1,199; Galaxy S III from RM799; HTC One S from RM399; or the Nokia Asha 311 for free when you sign up for a new plan with Maxis today – available for existing Maxis postpaid customers and port-in subscribers as well. A 24 months contract is applicable for the bundle above and an advance payment of RM500 will be applied for phones with RRP below RM500 and RM1000 advance payment for phones with RRP above RM500, which will be ccredited into the next bill. The bundles above will also get you 5GB of storage space on Maxis’ very own Loker. More information available over at Maxis.